Northwestern Mutual announced the first leg of its 2016 Inspiring Leaders: The Power of You tour, a multi-city summer and fall tour focused on instilling confidence and encouraging women to embrace their power to achieve their full potentials – personally, professionally and financially. 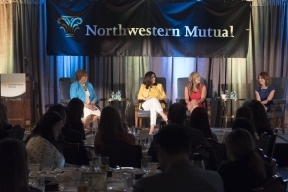 Northwestern Mutual launched the Power of You tour in 2014 in response to the increasing role women are playing – professionally, at home and in society, overall. Each panelist shared her personal experiences and insights on how women can gain confidence and empower themselves, and each other, to create a plan to reach their short- and long-term goals. The panel also discussed topics ranging from defining success and finding an authentic leadership style to financial empowerment and work-life balance. “We’re excited to bring the Power of You tour to even more women leaders and share insights into how they can tap into their unique power in a way that’s authentic to themselves, while in the process achieving success in planning for a strong financial future and managing opportunities and challenges in their careers and personal lives,” said Leslie Barbi, senior vice president of public investments for Northwestern Mutual. The Power of You tour stopped in Chicago on June 21st.